Want Rare Craft Whiskey Delivered To Your Door? Text This Number. Sorry, but that joke has a week left. Anyway, it's called Drinkeasy and it's the first text-based liquor store. No app, no store, just texts. So, how does it work? First you text the words "DRINK LOCAL" to 646-681-4442 to request an invite. 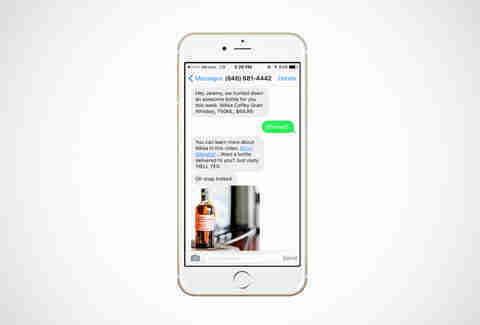 Next, a gang of experts comprising sommeliers, bartenders, and liquor store owners will send you a personalized text with photos and descriptions of small batch spirits that they think you'll love. These guys partner with the best liquor stores around to supply you with hand-numbered whiskies, artisanal gins, rare rums, and more. 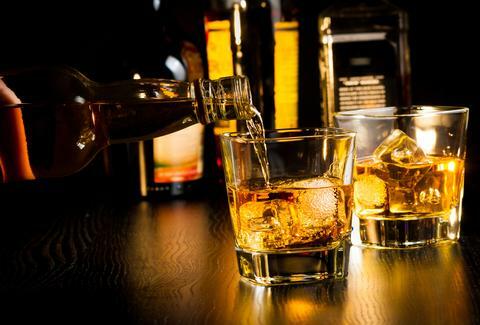 As you interact with the service more, Drinkeasy learns your tastes and tailors its picks for you. When you decide on a killer bottle, they'll ask for your credit card info and delivery address. Nothing is set in stone until you reply "HELL YES!" Plus, shipping is completely free, which makes sense, because the bottles are pretty damn expensive. Take, for example, this bottle of Nikka Coffey Whisky I was sent. It ended up costing around $64 and was delicious as hell. Plus, I didn't have to look for it myself. Unlike your typical delivery services which source their bottles from local liquor stores, these guys pull from places all over the country. Many of Drinkeasy’s selections are not available in local liquor stores because of their craft nature and limited distribution. How else would you get your hands on a bottle of gin from Iowa? Raise your hand if you've ever actually been to Iowa. Jeremy Glass is a writer for Thrillist and has this exact same idea, except with ice cream.